Adult mosquitoes feed on sugars from plants or from honeydew from other insects. That is all the males’ diet consists of. Female mosquitoes also feed on blood in order to produce eggs. Most females feed during a certain time of the day (usually during low-light times of the day), although some may feed throughout the day. Eggs hatch and become larvae, also known as “wigglers” or “wrigglers” due to the lashing movements of the abdomen. During this time, the larvae will go through four molts. Towards the end of the fourth molt, they become pupae. Then, they will emerge as adult mosquitoes. Adults prefer to hide in protected areas during the day, such as lawns, trees, shrubs, weeds and areas of dense vegetation. The first line of defense would be to reduce weeds and thin vegetation. Otherwise, a control “spray,” can be applied to the lower limbs of trees, shrubs and areas of heavy vegetation, under decks and around the foundation. Make the application in the very early morning or early evening. Other types of insecticide are also available including foggers for treating the insect when in the air and water additives to kill the larvae in containerized places where water sits or is stored. 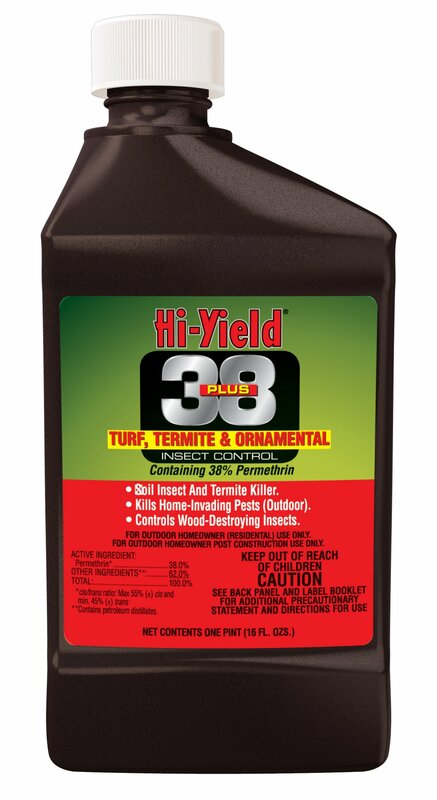 Hi-Yield 38 Plus may be used around the foundation, yard or landscape. This product will go far and last long in comparison to other sprays. 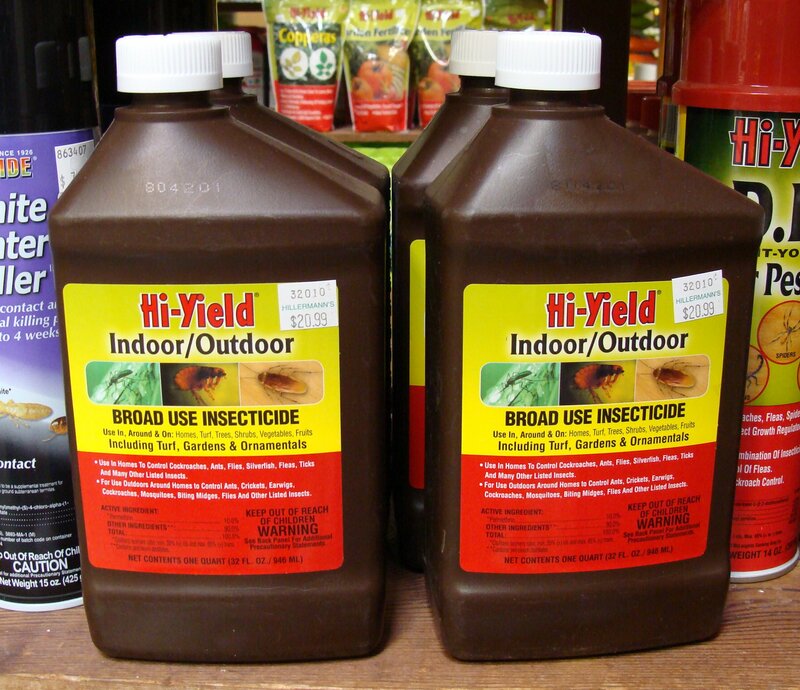 Hi-Yield Indoor/Outdoor insecticide is a good spray for the control of mosquitoes and other insects in both outdoor and indoor areas. 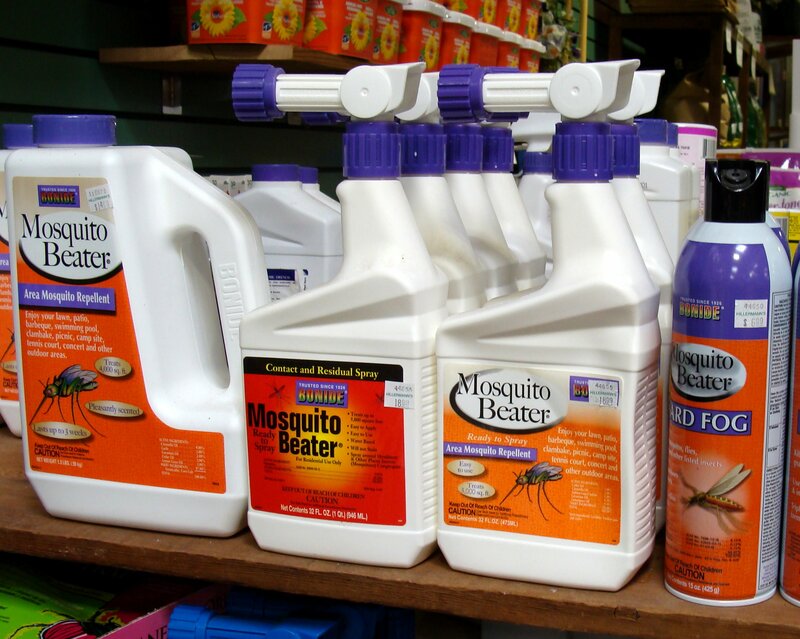 Bonide Mosquito Beater insecticide spray and fogger can be used as directed on their labels. Use the spray in areas as mentioned above. Use the fogger in outdoor areas for mosquitoes and flying insects. Keep people, animals, food or drink out of the treated areas until vapors or mist have dispersed. 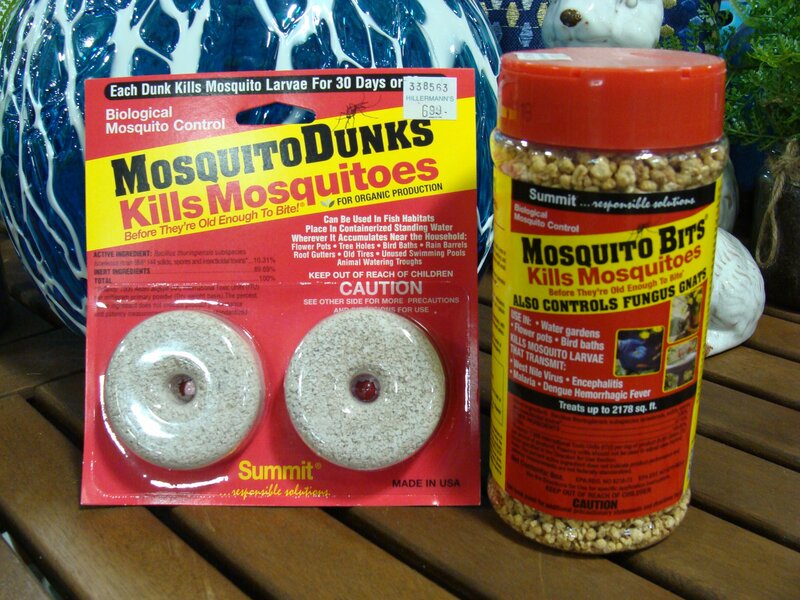 Summit Mosquito Bits and Mosquito Dunks are a great way to treat areas of containerized water where mosquitoes can breed. These products slowly release a biological mosquito larvicide at the water’s surface and kill the larvae before they are old enough to bite. Do not use in containers that store water for human consumption. Dunks will treat large areas of water and last longer (30 days or more) than the bits. Bits can be measured for smaller areas, but need be applied at 7 to 14 day intervals to maintain effectiveness. Repellents are also available. These products will be an irritant to flying insects and will repel them from the area that is treated. These are usually natural products that are safer for people and animals. 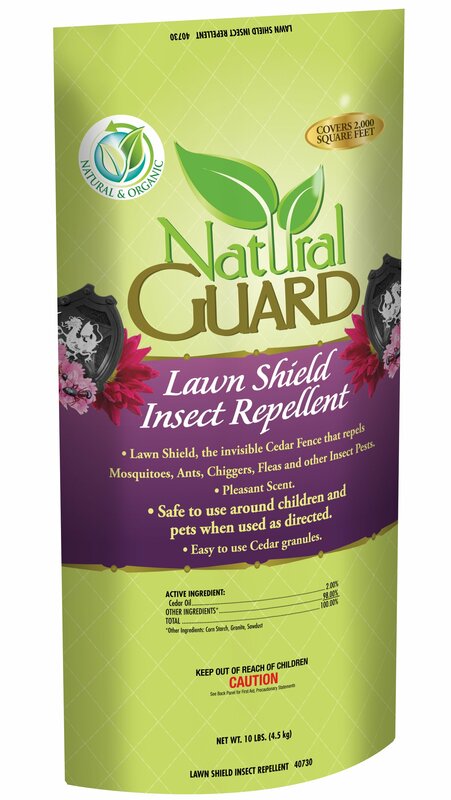 Natural Guard Lawn Shield Insect Repellent is an organic granule covered with cedar oil. It is an irritant to all flying insects and they will stay away as long as the cedar odor is present. It has a pleasant odor and is safe for children and pets. Re-treat when the pests return or when the cedar order dissipates. Bonide Mosquito Beater Repellant comes in a spray or in a granular form. These products are a blend of natural cedar, citronella, geranium and lemongrass oils that repel mosquitoes. They have a pleasant scent and can be used in areas where children and pets play. Re-treat after heavy rainfalls or after a few weeks pass. 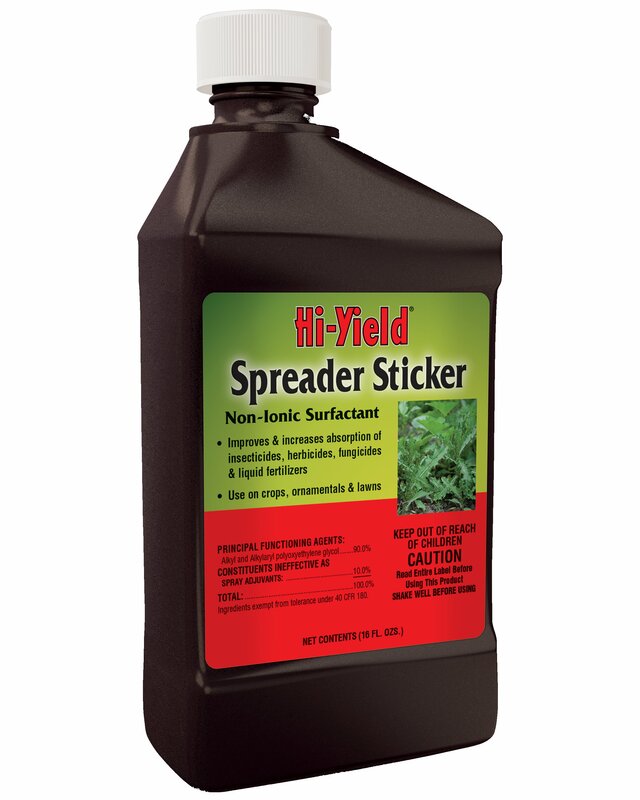 Use Hi-Yield Spreader Sticker in insecticide sprays to increase the coverage on plants and the length of the residue. Read and follow all labels carefully on all insect control and repellant products. Visit us for help with these products and more!